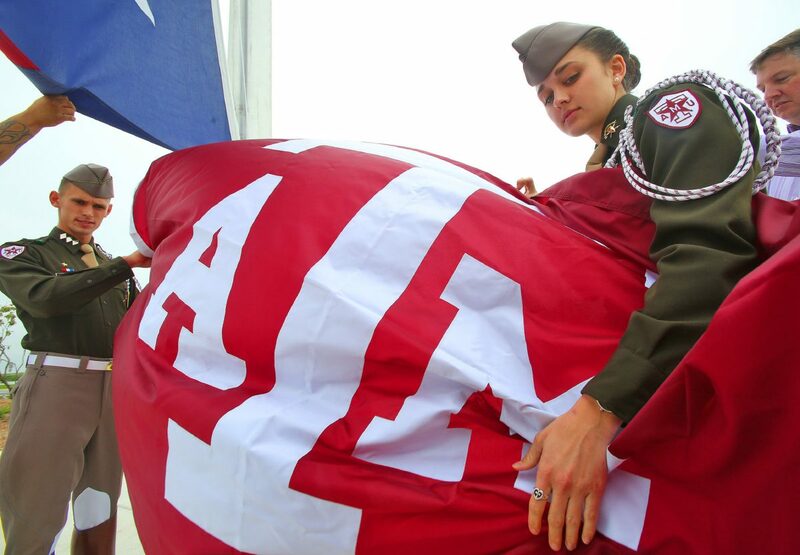 Members of the Texas A&M Corps of Cadets members Hanna Reckmeyer, right, and Justin Macmanus raise the Texas A&M University flag during a dedication ceremony at the Texas A&M Higher Education Center in McAllen on Thursday, Oct. 25, 2018, in McAllen. McALLEN— Nearly two years after breaking ground on the Texas A&M University Higher Education Center at McAllen, Aggies gathered again to now formally inaugurate the building along with Gov. Greg Abbott and A&M Chancellor John Sharp. The center is an extension of TAMU College Station and opened its doors to the first two cohorts of students, a total of 202 students, and 18 faculty and staff this fall semester. Area leaders and educators — including state Sen. Juan “Chuy” Hinojosa, D-McAllen, Hidalgo County Judge Ramon Garcia — were also present and spoke at the inauguration of the awaited facility. Construction for the initial 65,000-square-foot building, located on 100 acres at the Tres Lagos development in north McAllen, kicked off Dec. 15, 2017. But the university’s intent to set foot with their first brick and mortar facility in the city was announced since September 2015. Total cost of the building reached $40 million, a sum that rose quickly as the board of regents had originally approved $4 million, and soon added $36 million for its construction from Permanent University Funds, or PUF. “What we really think is that it’s just the start and we are going to have a great facility here that will grow and prosper,” said Texas A&M Board of Regents Chairman Charles Schwartz, who also attended the inauguration. The city of McAllen and Hidalgo County provided local financing of $10 million for the construction and contributed $24 million in infrastructure for the project, including drainage, streets and utilities. The first cohort of students was welcomed in fall 2017 with the help of a partnership with South Texas College, which allowed the university to rent out space to conduct its first courses. Texas A&M University President Michael Young said the current programs include public health, food systems industries management, biomedical sciences and two engineering pathways, multidisciplinary engineering technology degree plan and interdisciplinary engineering. Young said the current degrees are more than likely going to suffice for at least a couple of years as they are starting with a broad array. In agriculture, for example, there are about five different tracks you can take, he said, so for now there are enough tracks to fill this campus with qualified candidates. For Sharp, the goal of this building has remained constant as he once again told the audience he wanted to provide students a pathway toward Texas A&M in College Station, even if they’re unable to move out of the Valley. The campus will be overseen by Young with the help of a new leader, Adolfo Santos, who will oversee the campus locally.